National Farm to School Month is a time to celebrate connections happening all over the country between schools, food and local food! 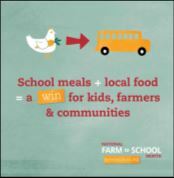 Farm to school enriches the connections communities have with fresh, healthy food and local food producers by changing food purchasing and education practices at school and early care and education settings. 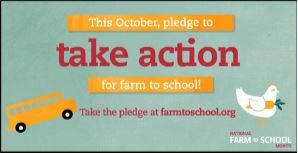 Everyone can celebrate National F2S month by telling @FarmtoSchool how you're supporting #farmtoschool in your community & you could win prizes for your school! On Thursday Oct 25th, NYSED CN Staff & friends will be taking over the NYSED building staircase once again to participate in the FarmOn! Big Apple Crunch! You too can coordinate a group to join the millions of New Yorkers around the state and take a coordinated "CRUNCH" out of a NY grown apple in effort to "Keep Farmers Farming" and inspire the community to eat local! 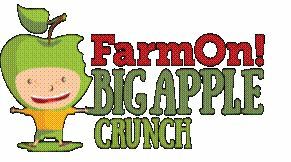 Learn more about hosting your own crunch at www.farmon.org and sign up for the Big Apple Crunch challenge to be eligible to win $1,000 for a FarmOn! Victory Garden for your school. Field trips are a great way to celebrate Farm to School month and teach students about where our foods comes from. 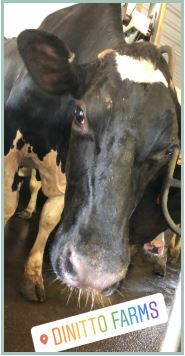 In addition to connecting students with their local food and agriculture system; fields trips to local farm, processing facilities, or community gardens are equally beneficial for school food service directors. This summer's Managing Your Child Nutrition Program training earmarked an entire day to Farm to School programming by providing a morning Procuring Local Foods workshop followed by a field trip to tour Dinitto Farms in Marcy, NY and North Star Orchards in West Moreland, NY. Look out for the announcement of next year's training on the CN website. In order to establish realistic goals with regard to increasing the availability of local foods in schools, USDA's Food and Nutrition Service (FNS) conducted the first nationwide Farm to School Census (the Census) in 2013 to serve as a baseline for data collection on farm to school efforts and conducted a second progress. The thrid census has been scheduled to be conducted by FNS in February 2019 for school year 2017-2018 to further assess the impact of farm to school across the nation. Communication about the Census will be sent to SFA Food Service Directors (FSDs) from an FNS contracted research firm, Abt Associates, and NYSED. FSDs are strongly encouraged to collaborate with other entities within the district, such as vendors, school garden coordinators, foodservice staff, or teachers, to obtain the most accurate data. Check out the USDA's Farm to School Activity Tracking Sheets to get a head start on gathering information which will be asked as part of the census and thus assist you complete the survey more easily. Your district's definition of "local"
The FY2019 Farm to School Grant Program Request for Applications (RFA) is now open to applicants! On an annual basis, the USDA awards competitive Farm to School grants to be used for training, supporting operations, planning, purchasing equipment, developing school gardens, developing partnerships, and implementing Farm to School programs. FY 2018 grant awardees include schools and districts (large & smal, rural & urban), Indian Tribal Organizations, agricultural producers or groups of agricultural producers, non-profit entities, and state and local agencies. for the most currect F2S info, including resources & guidance, training, grants & funding opportunities!